What fun at the Guild today! 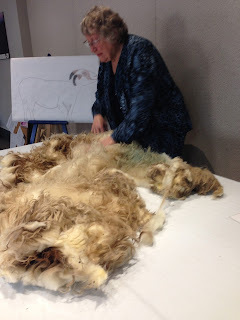 Sandra Jaycox of Silverwood Farms, brought in a fleece from her Ewe (Bonnie) and told us about the process of skirting and sorting the fleece. 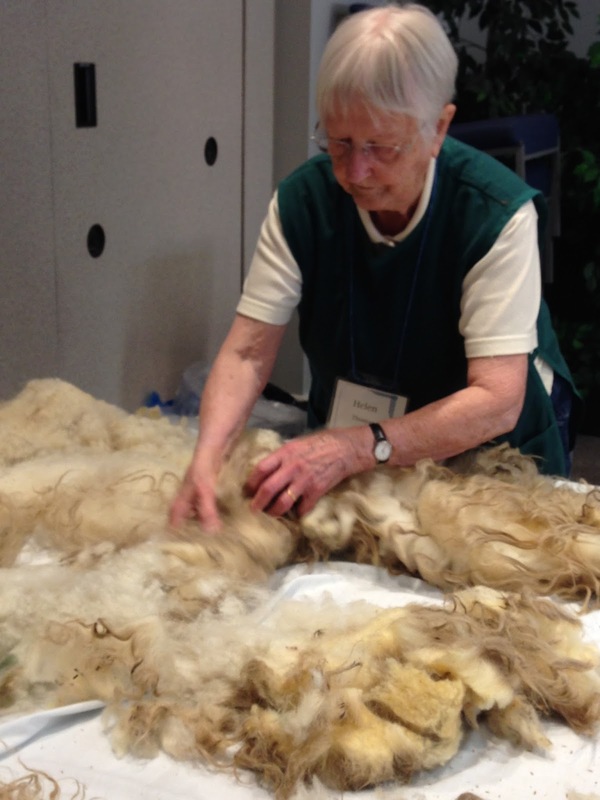 Sandra raises Icelandic Sheep and the fibre is absolutely beautiful. Sandra demonstrating the skirting process. Skirting a fleece is removing the inferior outer edge pieces. 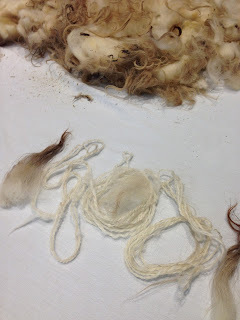 Much of this is done at shearing, before the fleece is rolled and bagged. When the fleece is unrolled the neck area is unrolled first, shorn side down. The fleece is heavily skirted starting on the tips side of the fleece, removing dirty and stained wold and vegetable matter. Fleece from the belly, neck, leg/britch (buttocks, outside of hind legs), haunch/tail areas is usually dirty and discarded. 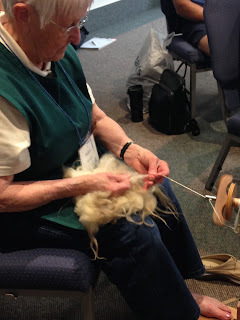 The fleece is turned over and the shorter second cuts are picked out. 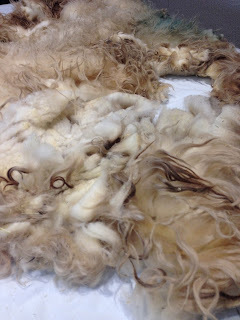 The Icelandic fleece is unique, there are two types of wool in one fleece, some refer to this as dual coated. The longer wavy or corkscrewed fibres are called TOG and the soft down-like shorter wool is called THEL. Sorting: The shoulder and sides have the best wool, shoulder having finest crimp. Next will be sides of the neck, then the hips. The back gets rain and sun exposure, some people like to sort it out for felting. 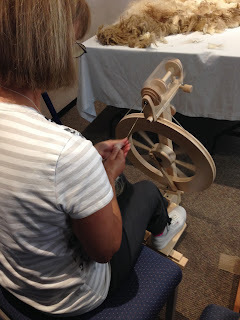 Helen choosing the fleece to spin for our demonstration. 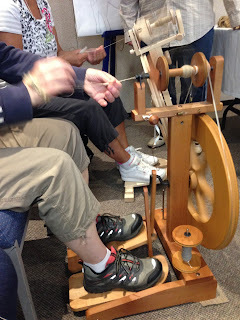 The process is sometimes called spinning in the grease, because of the lanolin content of unwashed fleece. Sample #3 (left) yarn from fleece with a combination of long staples and shorter fibres is not quite so coarse. Silverwood Farms can be found on Facebook as: Silverwood Farm - Icelandic Sheep.